Just one year ago we were in Europe. I've been reading my travel journal, remembering, and enjoying the trip all over again. Today's post features photos taken during our Avalon river cruise up the Seine. I can't say enough good things about the cruise. It's a good thing we can enjoy it over and over again in memory. The sunflower bloomed in Monet's Garden. Close to where our ship docked in Vernon, this house, bordering on the river, had an "Â vendre" sign out front. The gate was open, and the front door, so my friend and I walked into the garden and up the stairs. We were not quite brave enough to walk in the door, but we did peer in a little. Were we brash? The idea of purchasing such a house and renovating it occupied an hour or two of pleasant conversation later. Our husbands were not so enthralled with the idea. Wrought iron fences are a weakness of mine, and this one, painted robin's egg blue, went to the top of the list. I think my favourite colour is blue. (Any family members reading this are rolling their eyes and saying, "duh.") Isn't this the prettiest window? Blue gingham curtains with a little ruffle, blue shutters, and a pot of white flowers. It just makes me sigh with satisfaction. Church steeples dominated the landscape of each village. There is such disdain for the Church in many places today, yet people forget that without it, much of our knowledge would have been lost, health care would not be where it is today, and society would be very different. I'm not excusing the injustices and atrocities committed, but I think that modern society has lost its compass. We have become so arrogant that we believe we hold all the answers ourselves. It doesn't seem to be working so well. The old mill of Vernon straddles two piers of an ancient bridge. The waterwheel is long gone, but the mill has been preserved. It likely dates from the 16th century, and was painted by Claude Monet. An engraving of the mill is featured on the postal stamp of Vernon. The food on the Avalon Creativity was amazing! There was no standing in line at buffets, but instead very civilized dining with various beautifully presented courses, served by attentive waiters as the ship sailed along the river. Buffets were available for breakfast and lunch, but with only 80 people aboard, there was never a wait. There were always several choices on the menu, including vegetarian options. What really tickled my fancy was the option for a cheese course instead of dessert. The cheeses and accompaniments varied every night. Oh my, they were delicious! One last photo of Monet's house as seen from the garden. Do you make vacations last long after your return home? What makes a vacation memorable for you? What a coincidence Lorrie! Somehow Monet was in my mind too this morning. I have read a fantastic book about Monet's Giverny with many photos. The green window of Monet's house is so charming <3 As are the rest of your photos. I have only visited Paris a few times, maybe one day a longer visit to France. I enjoyed your lovely post - happy weekend. I can't believe that it is already a year since you were on holiday in France, and here in the Cotswolds too of course. I love the fact that we now have not just memories of holidays and lovely things that have happened, but we also have our digital photos reminding of us of things previously easily forgotten. We are so fortunate that we can take as many photos as we want and are not limited at all as we were with film. First of all, it surprises me that it has already been a year since your trip to France. Your photographs must help extend the time there...perhaps you almost experience the atmosphere, the sights, sounds, smells, and flavors...I could get interested in the cheese platter from your excellent photograph. Not having been on a vacation in several years, I am at a loss to answer your question. I really am becoming a dull girl! Thank you for a re-visit to Giverny. It seems long go thy we were there, but I have so many memories. I share your love for that charming window! Like other commenters, I can hardly believe that it's been a year since your European vacation. So much happens in a year's time . . . and yet, it seems to have gone quickly. Beautiful pictures. Your trip sounds adventurous. The blue wrought iron fence is a winner. The memories of a special trip such as this are just precious. Sometimes I just like to close my eyes and remember a walk through a garden, such as Monet's, or down a narrow street late at night. Oh I would have wanted to buy that house too. Another dreaming entertainment. 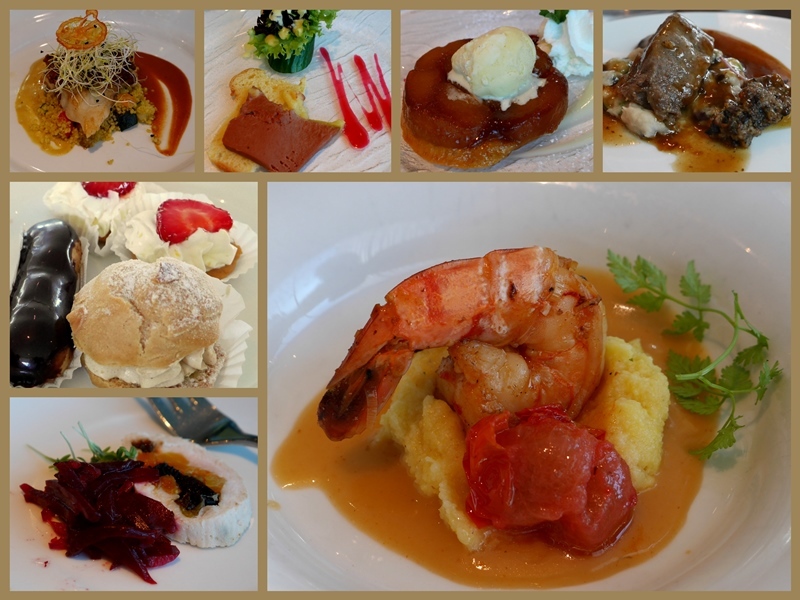 The food and the cruise sounds like it was so wonderful. Lorrie, what beautiful pictures. I love that home. It looks so peaceful and serene! The blue gingham and beautiful shutters are a delight. What a joy to have the ability with technology to go back and revisit such a great trip. We buy a Christmas bauble for our tree from new places we visit and then when we bring them out are able to recall where we bought it from and the memories of the place. Oh that vacation looks like one we will have to look at! We have never done a river cruise. That was a trip of a lifetime, and I'm thankful you have such wonderful photos to remind you of it all! I'm glad you are so willing to share it all with us, too! I always enjoy your travel and food photos! I especially like the shots of the cozy windows. Thank goodness for digital cameras. I so wish I had a photo album made up right after a trip or at least the photos culled and in a file on the computer. Even when that gets done we don't go back and relive it much. I hope to remedy that. Yes, it is the prettiest window I have ever seen (fellow blue lover here:). Perfect in every way. Three cheers for civilized dining. I tend to take a lot of photos while on vacation. Sadly they sit "in the computer". Occasionally I go back and revisit them. Wow! I'm new to your blog but I feel a connection to your thoughts on Monet, blue, steeples, faith and of course good cheese and fruit. Thank you! I so enjoyed this post Lorrie that I was sorry when it ended! Love the pictures so much and your personal take on the things you saw on your travels makes it all very interesting. I loved the little window with the blue frilly gingham curtains....lots of people just wouldn't have noticed that sweet detail! Thank you for the glimpses of Monet's garden too...someday I will go there! Thank you for sharing these wonderful memories Lorrie! Would love to see Monet's garden and house, and the blue window really is perfection!! I take pictures to preserve memories -- and often write a brief journal, especially if I won't be able to blog about whatever it is for a while. I kept more detailed travel journals when we traveled pre-blog ... and I'm so glad I did. I enjoy looking at them once in a while now and I figure some day when we're too old to travel and have adventures, I'll sit in my rocking chair and look at all of them again!